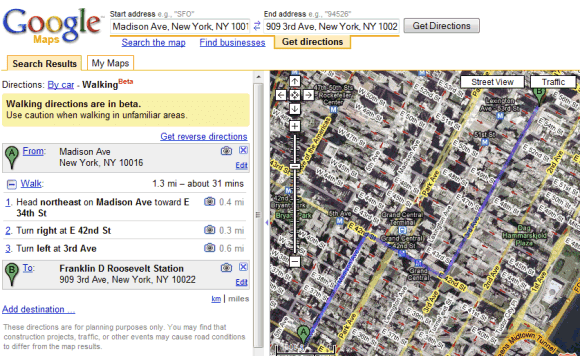 Google Maps tests a new feature: walking directions. You can already get driving directions and, for a small number of locations, Google Maps has transit directions, but these directions are not always useful if you don't use a car or a bus. Google suggests to "use caution when walking in unfamiliar areas", since the "walking directions are in beta". Chris, who sent this tip, spotted the feature for New York, but it's likely that Google randomly selected a small number of users to try the new feature and send feedback. Update (July 22): Search Engine Roundtable noticed that the walking directions are live. The new feature is available in most locations where Google offers driving directions. When I tried it last in New York it had me walking through buildings... luckily I know the city well enough that I don't have to rely on Google! ""use caution when walking in unfamiliar areas", since the "walking directions are in beta""
Does this suggest that they might be adding a "route approval" rating (RouteRank?) for safer routes? When making a walking route, they should include an option for either a) Less Walking Time or b) Less Hipsters. If I ask for directions from Manhattan to Staten Island, will I be told to cross the Brooklyn Bridge then go south to the Verrazano-Narrows Bridge and across to Staten Island, or will I be told to board the Staten Island Ferry? How about if I want to get from the Manhattan entrance to the Holland Tunnel to the Jersey entrance? Will I be told to walk through the tunnel? It doesn't appear in my account, why Google doesn't make this available for everyone? Walking directions (and biking!) are way more useful in European and Asian countries where there isn't such a heavy reliance on cars. Very happy to see this perspective included. In fact, when will see pedestrian traffic become the *first* priority and cars become the *last*??? This will be helpful for trails but for cities the driving and walking directions will be more or less the same. You can't walk (or bike) over the Verrazano. Great! been hoping for this. i think this would would work great for bikers too. unless you're one of those cyclists who refuses to use sidewalks. ? @Anonymous: That was Matan Arie's point. Yes it does factor in "non-walkable" directions. Manhattan -> SI gives you the Staten Island Ferry. Manhattan -> Jersey City gives you the "Ellis Island NY Ferry". Central Park paths also work. Do you think this would be the same as biking directions? Does it take into account that we really really really want to avoid hills? I have walking directions in my city but I can't see anyone using them unless they are downtown. Seems kinda pointless otherwise. And how will it handle those areas where you just know you DO NOT WALK through. Will it tell you to run like a crazed zebra through that area, or will it give you an alternate route? so are they going to get people with gps packs to walk across the world like they do for Google Maps? A good idea, but it appears not to take into account the locations of signalled crosswalks on busy streets. I live in Phoenix, not the most walkable of cities, and asked for walking directions from the Heard Museum to the Art of Soup, a nearby restaurant. The route suggested has me crossing 7th St. at Oak. That's suicidal. Safer directions would tell me to cross at the lights at either Virginia or Palm Lane, even though doing so would take longer. If the walking directions could be adjusted to take into account the locations of signalled crosswalks, then these directions would become a useful tool. will it be on iphone 3G? I can see this being very useful - not so much for me personally, as when I'm giving visitors directions to the office. I can give them a Google Maps link if they're coming by car - and now I can give them a Google Walk link from the station if they're coming by train. I'll be playing with this to see how well it works over the next few days! I would love a biking route including the steepness of hills...perhaps the streetside pictures could be useful in determining that. Includes directions to take a ferry! Can't you walk across the George Washington Bridge? Directions from Manhattan to New Jersey north of the turnpike have me walk all the way downtown to the ferry and then back up through Jersey City. I SO want this application to work... but I live in Mountain View (Google Central), and the walking directions are bizarrely lacking any of the public paths that are necessary shortcuts to get from one neighborhood to the next in the Mt. View/Los Altos/Palo Alto border area, where driving distances can be twice as far as walking ones. Useless! Is there a better description of how the routes and times are formulated? This is interesting because it adds a dimension not present N American culture (transporting oneself without aid of car/plane/train) since the time of colonization. Incorporating state bikeways, walking trails and understanding if times given are straight time or include sleep-time (4 days, 16 hours from Milwaukee to Minneapolis is non-stop?) would be interesting. I use this for biking directions... it would be great to have biking directions. I like the feature to change the path. i'm from the UK and i understand the frustration of the walking directions, i wanted to see how far i walk with my daughter to school and it took me 2 miles in the other direction when i know theres a cut through, if only you could adjust the route so it could incorporate your own cut throughs (espec good if you giving directions). The walking directions had me walking ON the freeway! I agree that you should incorporate bike directions, it would be a lot more useful than walking. Yes, Biking directions are really what we need. More and more people are using bikes. Good directions would help this trend. I am going to Europe on a cycle trip and would love to plot some good bike routes. I also want bicycling directions. Are you listening, Google? I am doing a fund raising walk across the US in 2012 for vulnerable elderly and their caregivers and need walking directions from Wrightsville Beach, NC to Cambria, CA. I will be driving one of the Google routes this October. Does Google have a method for providing feedback about the accuracy of their routes? (I drove the NC segment last year and it was 30 miles off, a big difference when you are walking 15-20 miles a day).